Seven Species (and more) Salad | eat. cook. blog. My favorite Jewish holiday begins tonight at sundown. Sukkot commemorates the time when the Jewish people wandered in the desert and lived in temporary shelters. It’s a harvest festival, and during this weeklong celebration we spend time outdoors in a sukkah, a makeshift structure covered with branches to look just like the huts our ancestors used. It’s also a chance to move beyond the material comforts of home, —and connect with family and nature. We’ve been building a sukkah in our backyard since the kids were in preschool. They used to love helping Tony build it and helping me decorate it (they’d make yards and yards of paper chains & draw pictures, I’d hang twinkle lights and dried gourds and other fall-inspired decor – easy to find with all the Thanksgiving stuff in party stores). Well, its been a very long time since the kids were in preschool, but we still build a beautiful sukkah (sans paper chains). 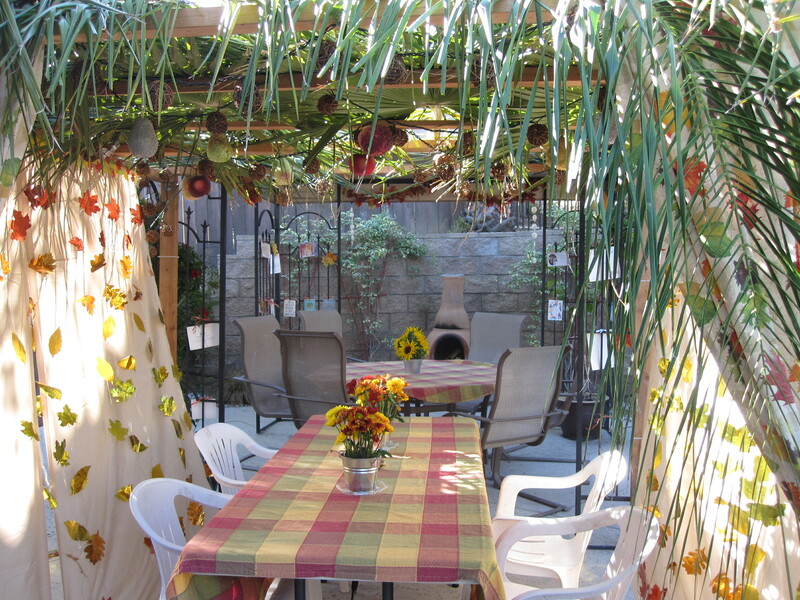 It’s traditional at Sukkot to invite friends and family for dinners in the sukkah. Since the weather is typically still very nice in San Diego at this time of year, it is so pleasant to sit and linger over a delicious meal outside. At one time, we had several Jewish families on our street (including a Rabbi and a Cantor!) and we organized “sukkah crawls”, where we would walk from one house to the next for different dinner courses. We still have a smaller version of the “sukkah crawl” with our good friends Tom and Barbara and we invite different guest over during the week. With the emphasis on the harvest festival, its also traditional to include dishes that include one or more of the “seven species” of Israel (fruits and grains that are native to the land of Israel)…dates, figs, olives, pomegranates, grapes, barley and wheat. 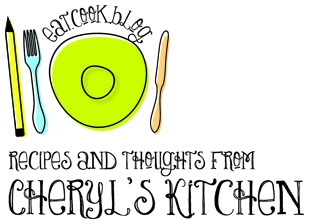 My mission this year was to find a recipe and create a dish that included all seven! I found a few different versions of a “Seven Species Salad” and ended up pulling a bit from each and modified a rice salad that I make (using Trader Joe’s Rice Medley) to create this one and I really like it. And remember that leftover vinaigrette from the Urban Solace salad? It is perfect for this. Can’t wait for the sun to set so we can eat it in our sukkah! Cook one package Rice Medley according to package directions. Pour into medium sized bowl and let cool a bit. If you don’t have a Trader Joe’s near you, you can cook your favorite type of rice; wild rice would be delicious and you should be able to find barley in the bulk bins of a natural foods store. Cook the wheat berries in a pot of boiling water (unsalted), uncovered, until just tender (I wanted them to still have a little “bite” to them), about 20 minutes. Let the wheat berries cool a bit and then add to the bowl with the rice blend. 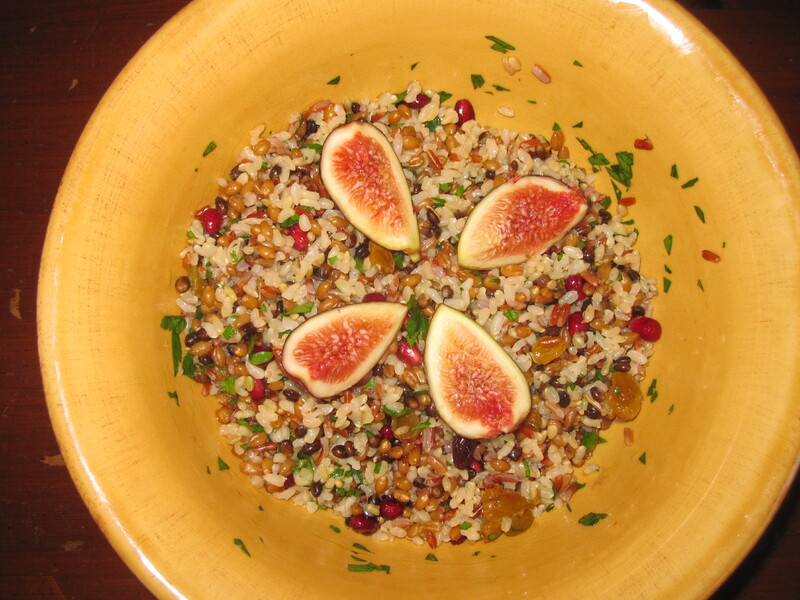 Add the parsley, pomegranate seeds, raisins and dates to the rice & wheat berries and then toss with about 1/3 – 1/2 cup of the vinaigrette. Season with salt and pepper to taste. Garnish with the fig quarters. This salad is best made at least an hour, or up to several, ahead of time, for the flavors to blend. Cool and then remove from fridge, to get to room temperature, before serving. I had no idea you build a sukkah every year–you are just filed with surprises! Love it!